The romantic idea of dreaming has been captured in a bottle. Tommy Hilfiger's latest fragrance, Dreaming, is an enticing blend of succulent peach and airy flowers that perfectly encompasses the essence of our dreams. These are lofty terms to speak of, I know. But the new Lip Gloss and Rollerball Duo of this fragrance brings out the romantic in me. Freesia, tuberose, white hibiscus, white woods and orris combine with the aforementioned peach, creating a sweetly seductive fragrance that lingers ever so beautifully on the skin. 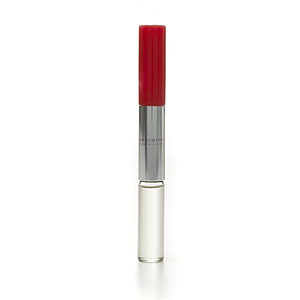 But this duo would not be complete without the pretty lipgloss that accompanies the fragrance. A beautiful shade of reddish pink with just the subtlest touch of shimmer, the gloss isn't at all sticky or tacky and is super-flattering. Best of all, it's scented with peach! And my favorite part of this fragrance? The fact that it's a rollerball, of course! I love the easy accessibility that the slender tube provides, letting me slip it ever so effortlessly into my clutch for a night out on the town. Go ahead and dream.